This week’s blogger round-up is going to be a little different. Paula McInerney from Contented Traveller, whom I have featured several times in this blog, has nominated me for the Liebster Bloggers Award. It’s a little different from the other awards in that it is designed to encourage fellow travel bloggers, particularly those with a smaller audience, and to introduce them to other readers, which is also the aim of the round-up. The word “liebster” has several definitions including kindest, nicest, beloved, lovely, kind, pleasant, valued and welcome which are all very positive and encouraging. After answering Paula’s 7 questions (the original number seems to be 11, but I’m happy to downscale), I will then nominate 7 other travel bloggers for the award, all of whom I have already quoted here. I will then ask them 7 questions which they will answer in a post. They will display the Liesbster award on their site, nominate the bloggers that they wish to promote and ask them 7 or whatever of their own questions. Et ainsi de suite. I’d just like to say thank you to Paula over at Contented Traveller for thinking of me. 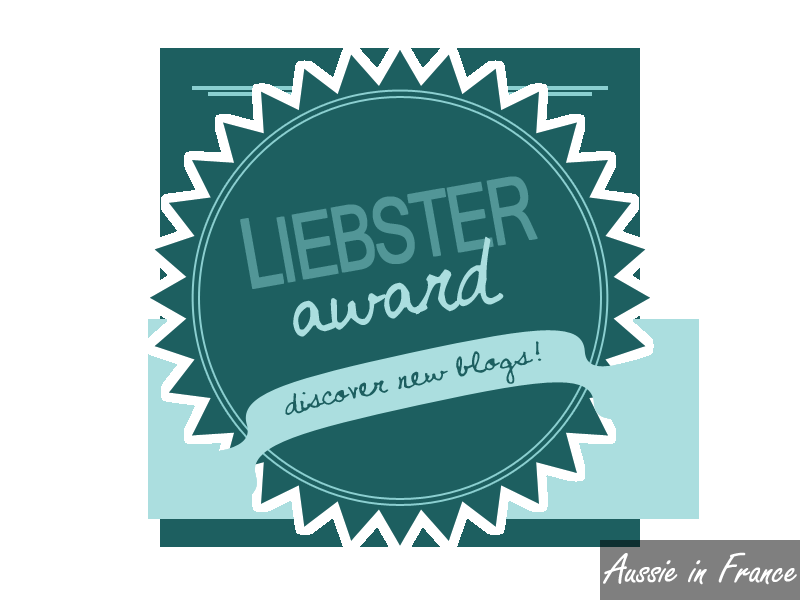 I love being part of the extended blogger community and I really like the idea of the Liebster Award. What made you decide to take up this wonderful gig of travel writing? My son and I were talking one evening just before he went to Australia and I mentioned the book I’ve always wanted to write about my life in France. He suggested a blog (I don’t think I had even read one at that point), set it up for me and that was the start of a wonderful adventure. This is a hard one to answer. Maybe the immensity of the blogosphere. There are so many different and wonderful blogs to discover, each with their own focus. When you read other travel blogs what is the first thing you look at? The photos I guess, but the text is important too. As we like to go off the beaten track, I’m not really interested in a description of a monument, for example, but rather the story behind the visit. What is one piece of advice that you can share with people that are thinking of trying to get into travel blogging? Start small and take it one post at a time. Write about subjects you care about. It’s also useful to check out blogs about blogging and learn how to improve readership, for example. As I live in France, most of my friends are French and not many in my age group are into blogging. All my blogger friends, whom I’ve made through the blog, are English speakers! How do you balance social media and writing? I currently write four posts a week: on Mondays, I select the photos that have had the most success during the week on Instagam, Tuesdays I write a “real post”, Wednesdays I publish my weekly blogger round-up featuring 3 other blogs and then Fridays are devoted to my ponderings on the French language with Friday’s French. I usually write them up in the evening, along with my Blois Daily Photo photos and look after social media in the morning before I start work (I’m a freelance translator) then at various times during the day. 7. How do you publicise how wonderful your blog is? I don’t know about publicising how wonderful my blog is but I share it on Facebook and Twitter. My experience is that one day you accidentally write a very popular post, such as Five Places to Lunch near the Louvre or The Best Area to Stay in Paris and suddenly your readership increases. Gigi’s French Window – this one is a little bit different because Jill was nominated by someone else almost at the same time but I would still like to mention her. When you started your blog, what did you set out to do? Do you think you are meeting your objective? Has it changed along the way? How would you classify your blog? Do you ever wonder whether you should keep it up or throw in the towel? If you do and still keep writing, what stimulates you to do so? Have you met any of your readers apart from your friends? What is the best thing about blogging? And the worst? Congratulations to you all and good luck with your blog! This entry was posted in Blogging, Uncategorized and tagged liebster award. Bookmark the permalink. Sometimes happenstance plays a part… I remember posting pics from the grounds of one of our museums here, and a month or so later, a relative of the person who put the sculptures up commented on it. That must have been good! You’re very welcome Phoebe. Thanks for accepting the nomination. Great that you are so popular! That’s wonderful news. Perhaps you could answer the two sets of questions and then ask a new set yourself.